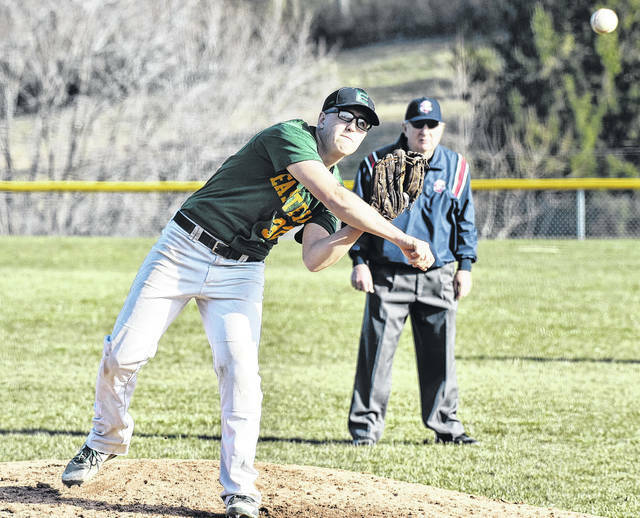 Eastern senior Kaleb Honaker delivers a pitch in game one of the Eagles’ doubleheader sweep of South Gallia on Wednesday night in Mercerville, Ohio. 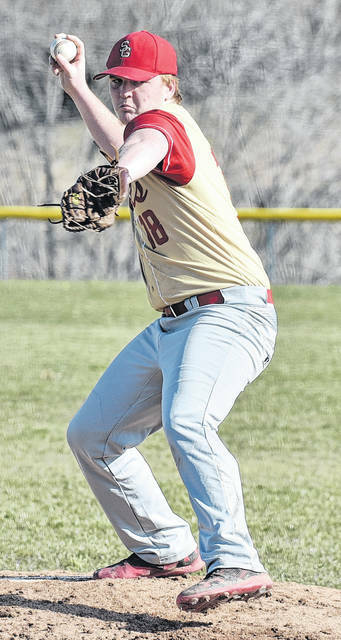 South Gallia senior Brandon Rutt delivers a pitch in game one of the Eagles’ doubleheader sweep of the Rebels on Wednesday night in Mercerville, Ohio. MERCERVILLE, Ohio — The Eagles keep flight atop the conference. 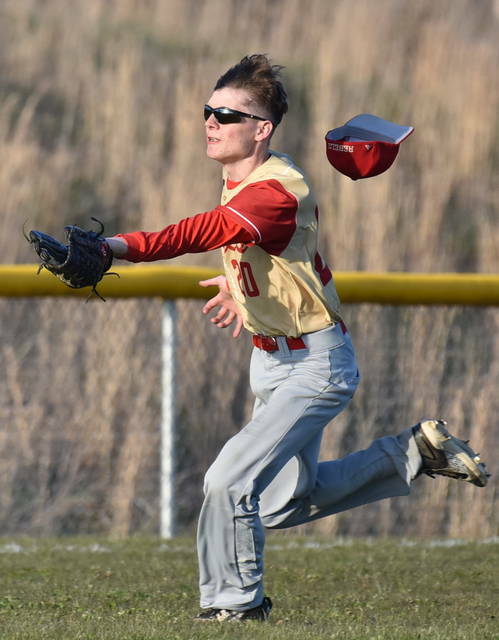 The Eastern baseball team remained perfect in the Tri-Valley Conference Hocking Division on Wednesday night, as they earned a doubleheader sweep over South Gallia in Gallia County. The Eagles (11-1, 7-0 TVC Hocking) proved victorious in the opener by a score of 20-0, then immediately continued their winning streak with a 15-0 victory in the finale. South Gallia (0-4, 0-3) was held to three hits in the opening contest, as the visitors scored at least one run in every inning. EHS jumped to an 11-0 advantage in the first, as they sent 17 hitters to the plate and collected six hits while drawing six walks. The Eagles tacked on three additional runs in the second, as Owen Arix, Austin Coleman and Ethen Richmond scored in the inning to extend the lead to 14-0. Eastern added six more runs over the final three innings of play to earn a 20-run victory in five innings. Kaleb Hill was the winning pitcher of record, as he allowed no runs on no hits with two walks and one strikeout in one innings of work. Arix provided two innings of relief and surrendered no runs no hits, while striking out five hitters. Kaleb Honaker worked two innings, as surrendered three hits, zero runs, allowed one walk, with three strikeouts. Arix and Coleman led the way at the play for EHS with three hits apiece. Matthew Blanchard, Hill, Ryan Harbour and Richmond each added two safeties, while Nate Durst and Josh Brewer provided one hit apiece. The Rebels mustered just four total hits in game one, as Jared Burdette led the way with two safeties. Wyatt Rapp and Austin Stapleton concluded the offensive totals for SGHS with one hit each, respectively. Jared Burdette suffered the pitching loss for South Gallia, as he lasted just 27 pitches into the first inning. Shawn Ward appeared in relief through two innings, while Brandon Rutt provided three innings of work. The tandem of South Gallia hurlers combined to surrender 20 runs on 16 hits, with 15 walks while striking out five hitters. The finale was all in favor of the Eagles as they defeated the Red and Gold 15-0 in five innings. Eastern soared to a 4-0 advantage in the first inning, as Blanchard, Durst, Brewer and Honaker each provided runs. 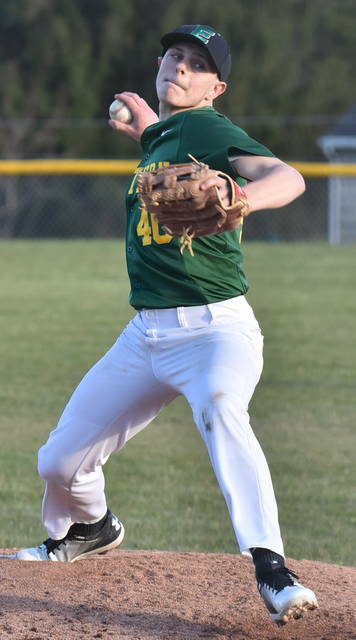 Both teams were held scoreless in the second, but EHS added four additional runs in the third frame — as Durst, Hill, Harbour and Arix scored to extend the Eagles’ lead to 8-0. EHS sent 11 hitters to the plate in the fourth, as they manufactured seven runs on four hits, two walks and one error to take a 15-0 advantage into the finale. South Gallia failed to cut the deficit in the top of the fifth, as Eastern closed out the 15-run victory. Isaiah Fish was the winning pitcher of record in game two, as he allowed no runs, no hits, while striking out four hitters in two innings of work. Josh Brewer provided three innings of relief, as he surrendered no runs on one hit, and collected seven strikeouts. Brewer also had three hits to led the Eagles at the plate. Kaleb Hill had two safeties, while Fish, Harbour, Reynolds and Arix added one hit each in the finale. Austin Stapleton had the lone hit for the Rebels. Stapleton was also the losing pitcher in the contest.